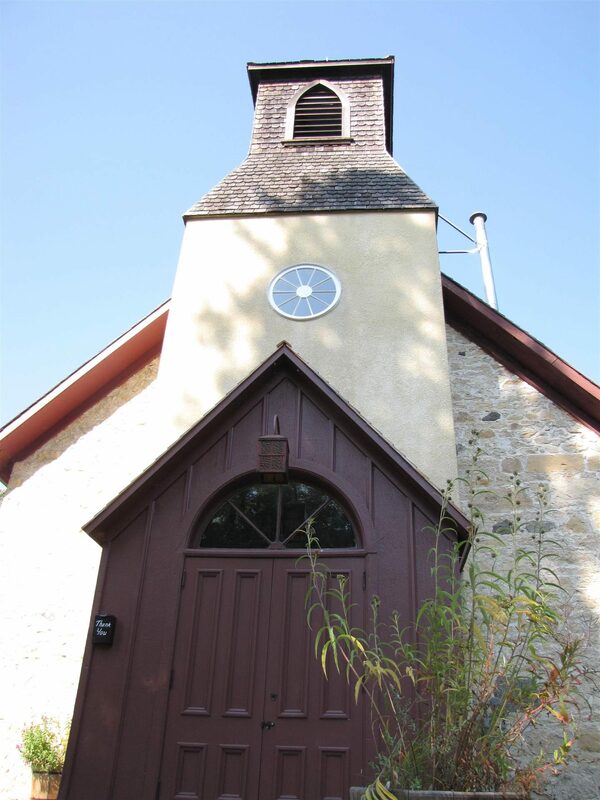 In 2016, work officially began to restore the Little Britain United Church’s bell tower structure and was completed at the end of June, 2017. Construction of the current stone church began in 1872. The bell tower was added in 1920 as a memorial to the veterans of World War One. The restored bell tower was re-dedicated to these veterans and other members of the Canadian Armed Forces who have served their country. 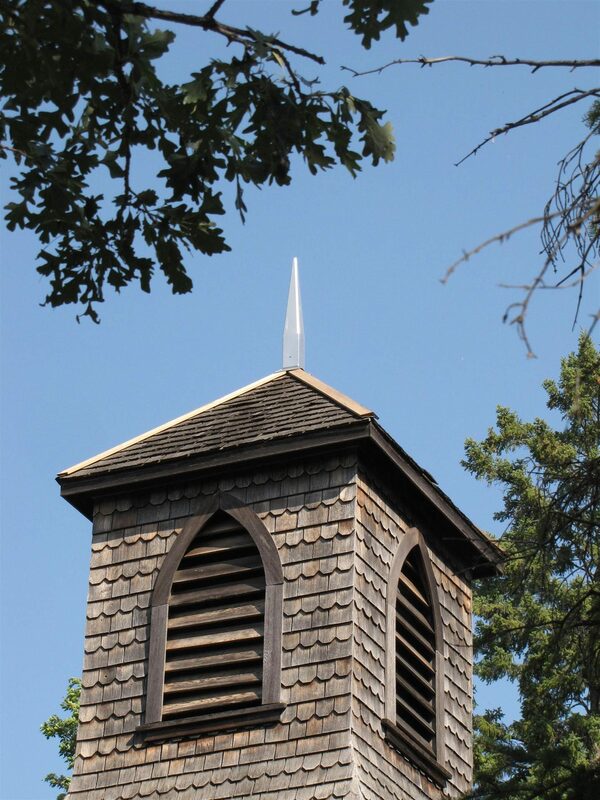 The congregation of Little Britain United Church gratefully acknowledges funding contributed by the Government of Canada under the Canada 150 program and the Government of Manitoba under the Designated Heritage Building Grants Program for Bell Tower Restoration project. We celebrated our 165 anniversary and enjoyed worship with our guests from Tabula Rasa Choir and the Kildonan Hand-bell Choir. After worship there was a short re-dedication ceremony and heritage games and activities led by the Manitoba Living History Society, with lunch to follow. Below is the Reflection preached during worship, by our minister, Rev. Shelly Manley-Tannis, from the point of view of the bell. Most of you have never met me in person. You have heard my voice, answered my summons, and now celebrate my safeguarded safety for many more decades. I have been sounded in celebration as your marriages were begun, your babies were born and baptized, and as you welcomed new members and leaders in your midst. I have been tolled in mourning as your hearts were broken by the deaths of those you have loved. My song has echoed up to the stars on a clear Manitoba winter night, and reverberated down in the earth on a foggy Red River morning. I am the bell, forged from that same earth, tuned to the right note, and hanging just so, in the tower just above and behind your heads. 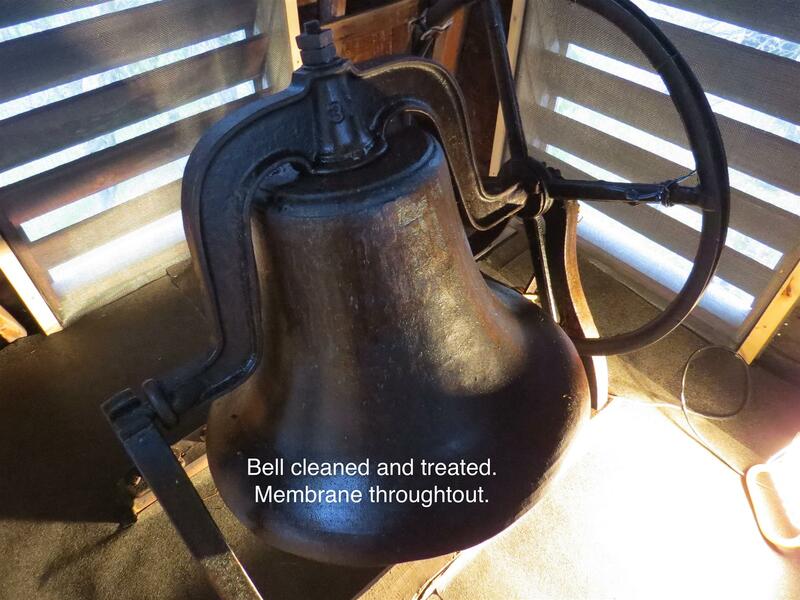 Attached by strong ropes and awaiting your summons I will ring again soon. I know you are celebrating much more than me this morning – I have not been here 165 years – though, neither have most of you! Sure enough, not quite 100 years, have I been waiting there above, calling out your occasions when it is time and holding the silence of the universe in between. But beyond and before that time – when I was cast and shaped and tuned, delivered and balanced there – I was. Birthed from minerals – elements in the earth present for the past 2 billion years – I am ancient and I am related to you. A long time ago, when creator was working in the ferment of water and tiny creatures on this planet who gave oxygen as a gift, there came the birth of layers of iron. The humans, you, when you eventually arrived, were formed of the very soil, water and minerals that made up the earth. Then Creator gave you earth and iron and water and each other as gifts. – bells and flutes and wheels and ships – but you also learned to make weapons, alienate creation and murder your sisters and brothers. The reading you heard today is one way you humans have tried to explain – how and why and when did this happen…Cain and Abel showing up again and again, generation after generation, as in the times of war and great change. The people who first told this story knew the connection with the land and their very selves, they spoke and lived the story of God’s use of earth and breath to love you into being. And so when a human allowed his anger to overcome him and ended his own brother’s life, the story-tellers admitted they didn’t know why. But they affirmed and knew that Creator was there, beside them, though sometimes it seemed that they and you would forget. I have seen over the centuries from my vantage point from within the earth itself that land and borders and boundaries have been the centre of your struggles. From the time of Cain who was separated from the land he loved because of his offense, to the execution of the beloved one Jesus the Christ, to the declaration of the land as empty in the ‘new world’ for those in power to take what they wanted, to the fields of blood in WWI Europe awakening you to a new awareness of brutality, to continued hostility in every piece of the planet – the story has continued, as far as I can see. And so, in the footsteps of the Christ, here, on the bank of a winding river, in a land that was far from ‘empty’ a congregation has struggled to be part of the work of telling that part of the story. This was and is not always easy – and you know that you have made mistakes. But there have been actions and enactments of this side of Creation’s story that are full of life – and these are partly what you celebrate today. That time in Europe now 100 years ago, had I been able to speak, I would have tolled with the cries of the people as many of your loved ones would never come home. Your flesh and bone and blood, returned to the ground – earth and mineral, in the end, all the same, but far away. And so, a plan to build a tower, create a sound that could ring out in mourning and in joy – a handiwork of the earth to honour those who were lost and to play aloud that song that would offer hope in history instead of fear and despair. Creator gave and gives this earth for you to love – your selves, your neighbours, creation itself. The one you call Jesus – he knew – lived and died – the story of what violence can do to the world. And yet, he continued to show you and his Creator – only love. In his foretelling of what was to come he told them/you again and again that he would have to be in the ground, deep in the earth for three days, at one again with creation, a reminder of the connection that none of you can escape. And then from that very life-giving darkness, he arose into new life – reminding you even more fully of the promise that you are not alone. May it be that my sound helps you remember and resonate, We, You, all of your sisters and brother – human, animal and tree – made of the very same thing, walking geological formations, loved by a Creator and a Christ forged in life and death in the depths of the same earth that is beneath all of your feet. You too, as well as I can continue to sing out love through our vibrations – from earth to air to ear to heart.